Min. 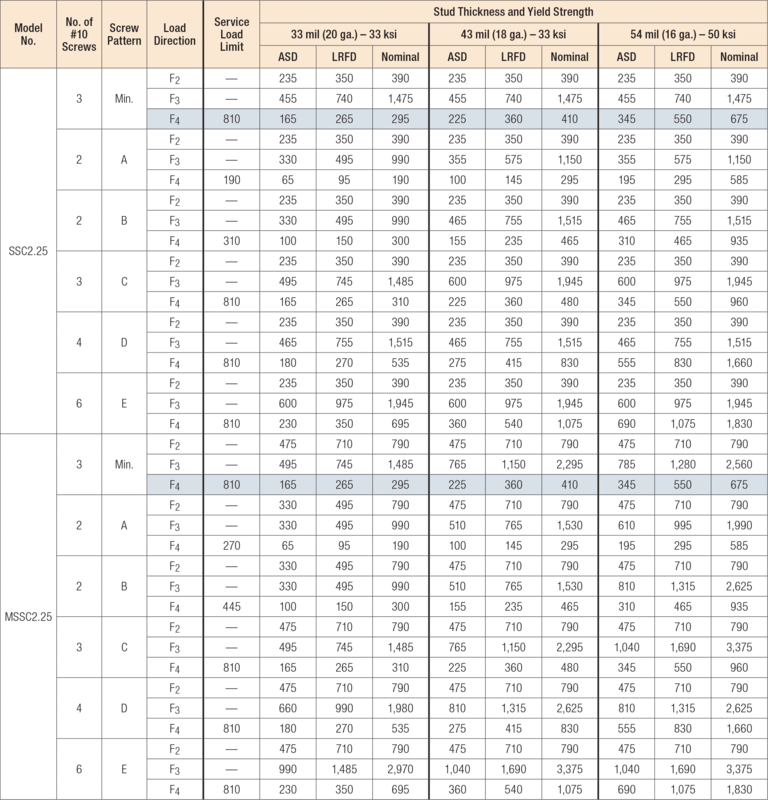 fastener quantity and load values — fill all round holes; Max. 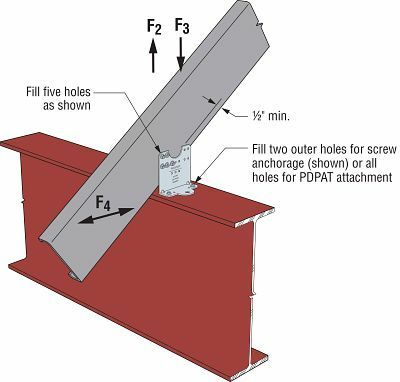 fastener quantity and load values — fill all round and triangular holes; Outer fastener quantity and load values — see illustrations for fastener placement. 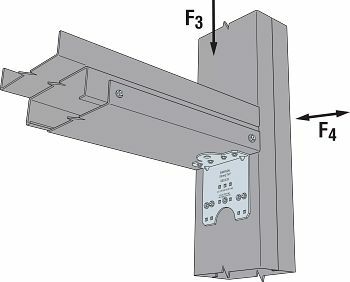 Allowable loads are based on bracing of the members located within 12" of the connection. Maximum allowable load for connector that may not be exceeded when designing custom installations. Designer is responsible for member and fastener design. 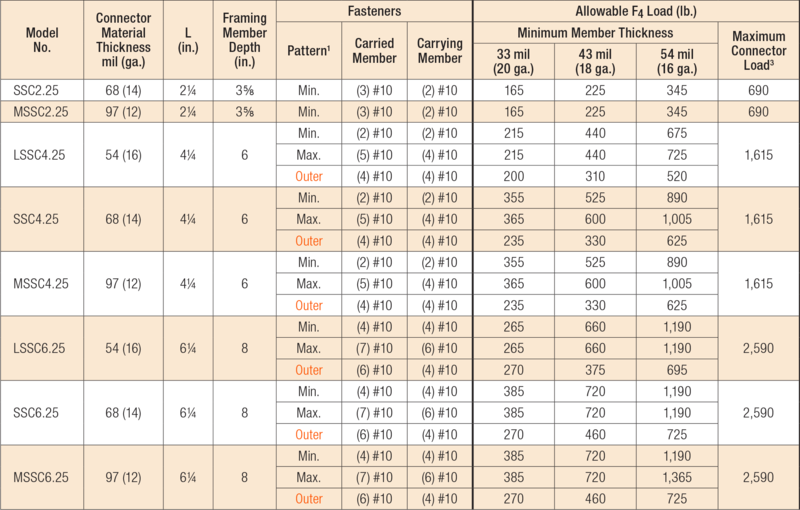 See image gallery for alternate screw patterns. 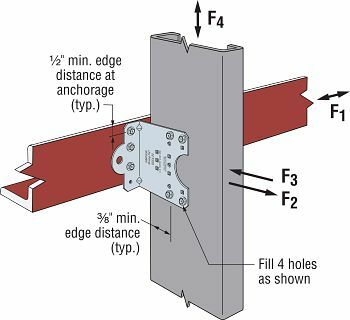 Allowable loads are based on anchors installed in minimum 3/16"-thick structural steel with Fy = 36 ksi. Allowable loads based on in-plane loads applied at the centroid of the fasteners to the stud, with no rotational restraint of stud. Max. 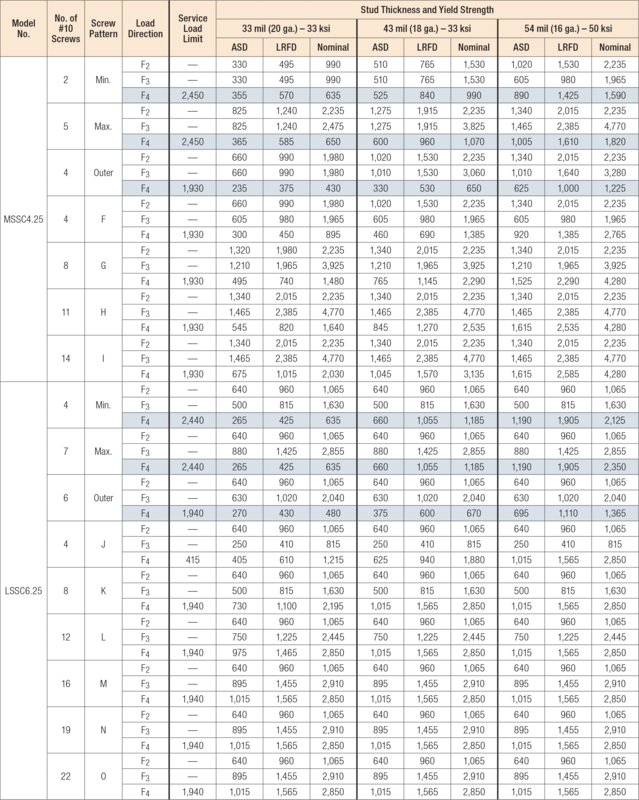 fastener quantity and load values—fill all round and triangular holes. Designer is responsible for checking web crippling of the header and reducing allowable loads accordingly. Also applies to box header per illustration. Allowable loads are based on minimum 33 mil (20 ga.) track for 33 mil (20 ga.) and 43 mil (18 ga.) studs, and minimum 43 mil (18 ga.) track for 54 mil (16 ga.) studs, with one #10 screw into each stud flange. Allowable loads assume adequate torsional bracing is provided. Bracing design is the responsibility of the Designer. See illustrations for fastener placement. Designer is responsible for anchorage design. 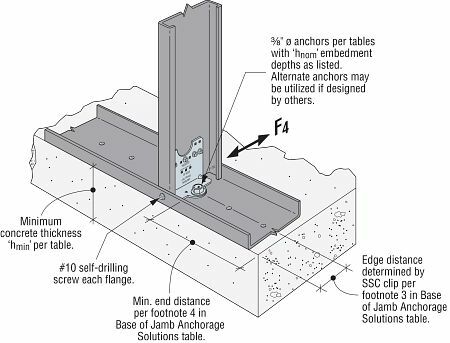 Allowable anchor capacities have been determined using ACI 318-14 Chapter 17 calculations with the minimum concrete compressive strength, f'c and slab thickness listed. Sand-lightweight concrete is abbreviated as "SLWC" while normal-weight concrete is abbreviated as "NWC". 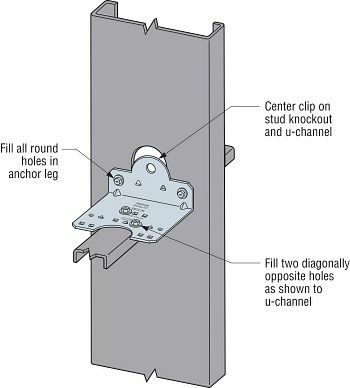 Edge distances are assumed to be 1.81", 3.0" and 4.0" (1/2 of stud width) as determined for 3 5/8", 6" and 8" studs, respectively. End distances are assumed as 1.5 x Min. Edge Distance in one direction and 'N/A' in the other direction. See installation illustrations in the image gallery. 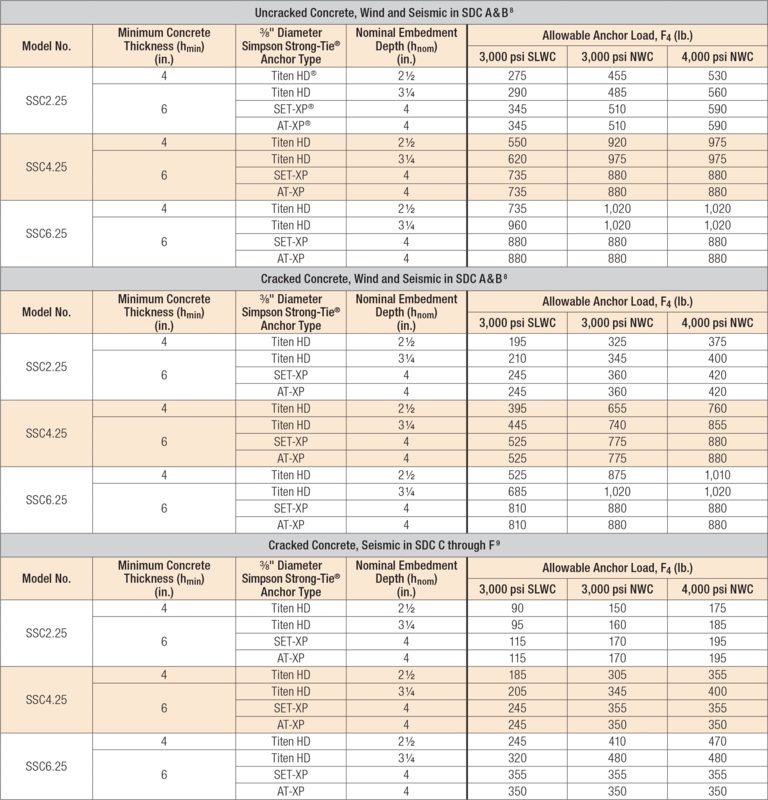 Load values are for a single anchor based on ACI 318-14, condition B, load factors from ACI 318-14 Section 5.3, no supplemental edge reinforcement, Ψc, v = 1.0 for cracked concrete and periodic special inspection. Reference ICC-ES or IAPMO-UES evaluation reports for further information. Tabulated allowable ASD loads for Wind and Seismic in SDC A&B are based on using wind conversion factors and may be increased by 1.17 for SDC A & B only. Allowable F4 load based on loading direction towards the edge of slab. Tabulated capacities are based on maximum allowable anchorage loads only. 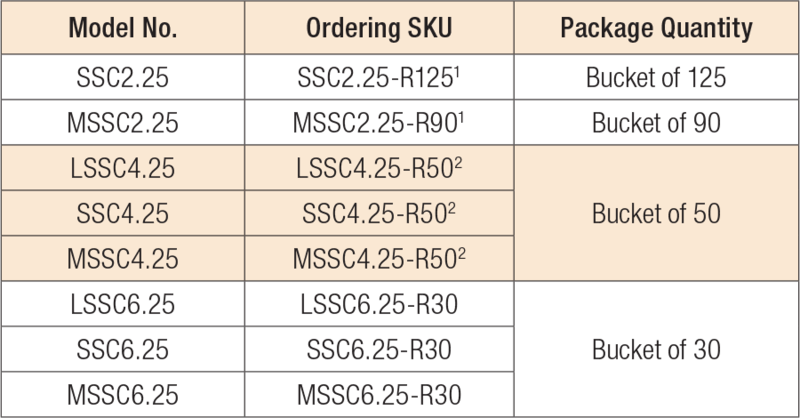 The capacity of the connection system shall be the minimum of the tabulated value and the allowable load value from the SSC Connectors: Base of Jamb Allowable Load Tables. Allowable loads are based on a 6"-deep member. For deeper members, Designer must consider web crippling of the member and reduce loads accordingly. Calculated values are per AISI RP15-2, AISI S-100, or generally accepted industry standards. Shaded values for F4 are derived from test data. Whenever possible, unshaded F4 values are based on the maximum calculated value and applicable tested value. Tabulated values do not include shear, web crippling, buckling, or other local effects in the member. The Designer must check member limit states separately. #10-16 screws shall have Pss ≥ 1,620 lb. 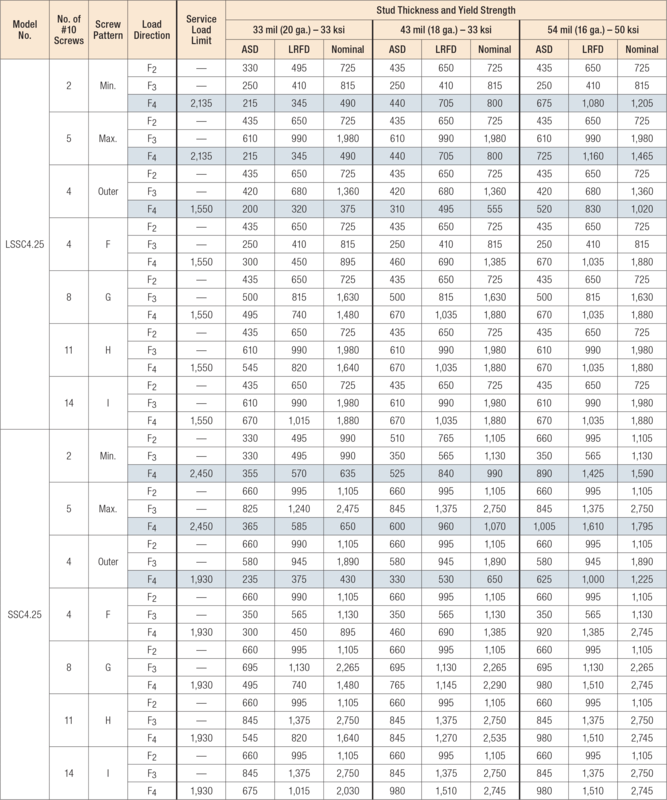 Calculated values are per AISI S-100. Screws must be installed with three (min.) exposed threads. For the minimum screw pattern, fill all round holes. For the maximum screw pattern, fill all round and triangle holes. See image gallery for screw pattern installation illustrations. 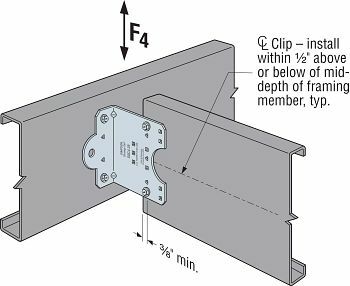 In addition to calculations of net and gross section tension, and screw shear of the clip leg attached to the stud, F2 values are also calculated for weak-axis bending of the anchored clip leg with the line of bending at the smaller anchor holes. The Designer is responsible for calculating pullover, pullout, and tension strength of the anchors, and this may reduce F2 strength compared to the tabulated values. For the F4 calculated values, it's assumed that the connection eccentricity is taken by screws in the supported stud. Service load limits for F2 and F3 are not given since there are no generally accepted industry methods available to compute these values. F4 service load limits are based on AISI Research Report RP15-2 for 1/8" deflection or applicable test data. Loads apply to connectors installed perpendicular or parallel to metal-deck flutes. Stud member design per Designer. Tabulated loads for stud fasteners are based on a minimum stud thickness of 33 mil (20 ga.) with a yield stress of 33 ksi. 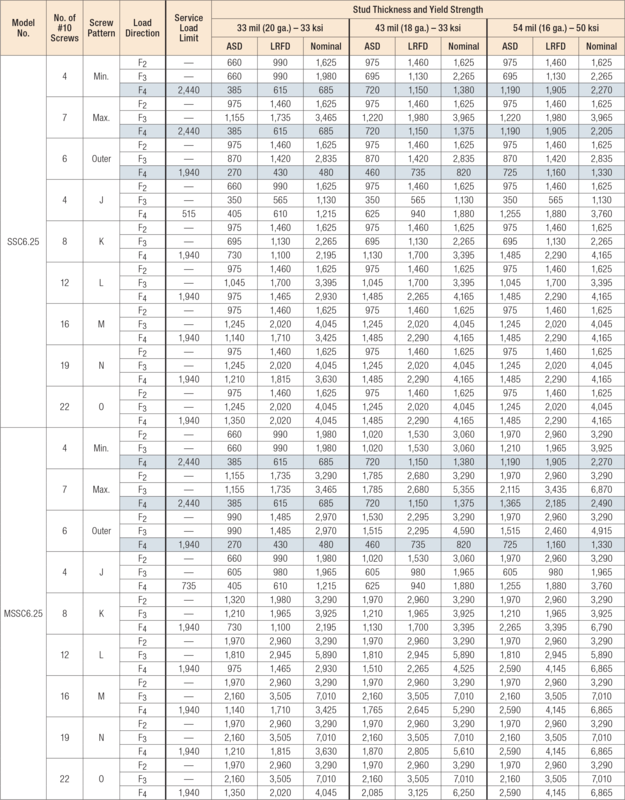 For 30 mil interior studs with a yield strength of 33 ksi, multiply the tabulated values by 0.9. Anchor design per Designer. Note that the SJC requires the symmetrical placement of one anchor on each side of the stud centerline. 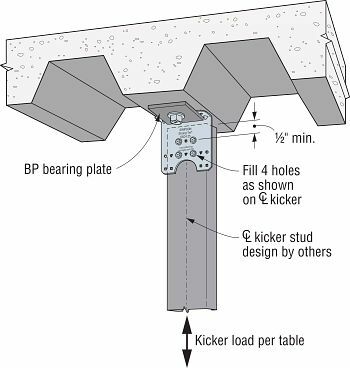 For the bearing plate option, use Simpson Strong-Tie BP1/2-3 bearing plates at each 3/8"-diameter anchor. Bearing plates are sold separately.